Are you looking for a way to workout with the best home gym equipment under $500? Finding high-quality equipment for this price range can be tricky. While there are tons of options available, many of them lack the quality and versatility you need to get good workouts from home. 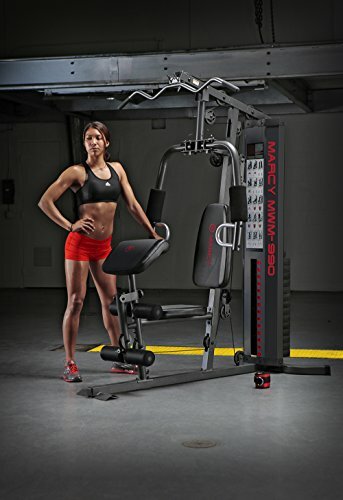 The Marcy MWM-990 is our number one pick due to the versatile range of exercises that are available, as well as the incredibly sturdy construction. If you’re trying to get your body in fantastic shape from the comfort of your own home, you’ll be interested to read more about what the top home gym equipment products have to offer. We’ve done all the research so that you don’t have to. Simply read through our review below and pick out the one that suits you best! The Marcy MWM-990 is our number one pick due to the sheer number of exercises it has available. There are over 30 exercises to choose from. They’re excellent at helping you to build muscle and lose fat from home. The first feature that stood out to us about this home gym is the construction. It has been made using heavy-duty steel materials. They’ve also implemented guard rods that have been reinforced. This design works to keep the weights steadily in place while you workout. In addition to this, we liked how you’re also able to workout comfortably. This is a result of the seat design. With an ergonomic design consisting of thick upholstery, you can be sure to workout without causing any discomfort. One other feature concerning the construction of this home gym that we were impressed by is the preacher curl. You can easily adjust or remove it to cater to your workout preferences. This home gym is equipped with a weight stack that goes all the way up to 150 lbs. If you’re a more experienced lifter, this maximum weight may not be challenging enough for you. However, for many people working out from home, having a 150 lb weight stack is plenty. We liked how they designed the resistance with a weight stack. This saves you the hassle of having to deal with heavy plates that can take up space and lead to injury. Instead, there’s a pin system. You simply put the pin in your desired weight stack and you’re good to go. To keep everyone in your household safe, they’ve also included a safety lock mechanism. This stops anyone from using the equipment who isn’t meant to. Marcy’s MWM-990 home gym is incredibly versatile. One of the main versatile features that we were attracted to is the dual action press. 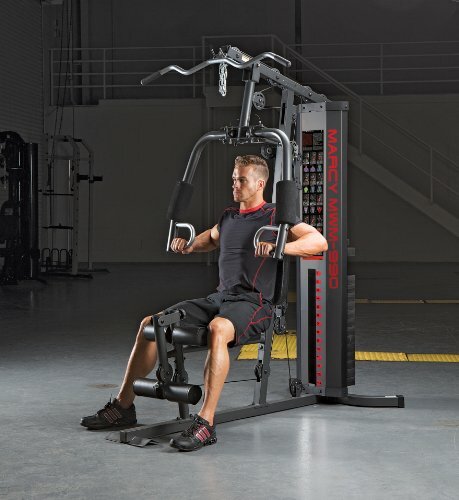 This mechanism enables you to workout with butterfly and chest press movements – with a single piece of equipment. This is fantastic for helping you to develop your biceps, chest, and even triceps. 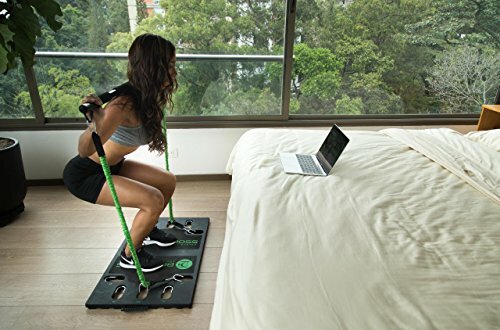 If you need something to workout from home that can also be portable for when you need to be on the go, the BodyBoss Home Gym 2.0 could be exactly what you’ve been looking for. It packs in tons of workout equipment and exercises, for below $500. The best feature that we noticed about this home gym was its portability. It’s very tough to find gym equipment that you can use from home, while also being able to transport it, hassle-free if needed. Since it weighs just 17 lbs, you can be sure to carry it around with ease. When it’s completely unfolded, it measures in at 20 x 24”. When you fold it up, it becomes a more compact 20 x 17”. They provide you with a workout platform as well as a bag to hold all the accessories. These include resistance bands, door anchors, bars, handles, and straps for your ankles and wrists. We liked how the creators behind the BodyBoss Home Gym 2.0 were focused on helping people to develop their strength. As a result, a lot of the exercises that you’re able to do involve compound movements. These involve using multiple muscles at the same time to get stronger. They have also ensured that you can workout with plenty of isolation exercises too. This combination of strength and isolated training is awesome for building muscles and strength in your upper and lower body, as well as burning fat. Some of the main exercises include overhead presses, squats, lat pulldowns, bicep curls, and many more. The VectorFit platform is something that users have been loving. This acts as the foundation of the home gym and it’s what enables you to complete so many different exercises. It can also take a maximum weight capacity of 500 lbs, which gives you plenty of weight to workout with. We liked how you can workout according to your experience level too. You’re able to start out with as much or as little difficulty as you like. This provides you with the room you need to steadily boost your strength and intensity over time. This is a result of the BossBands included. These can be added or removed depending on how much tension you want to create for each exercise. So, it doesn’t matter whether you’ve been working out for years, or just getting into it for the first time. The Ultimate Body Works is available at a very affordable price. It lets you workout with over 50 exercises with the convenience of setting it up easily within your home. The Ultimate Body Works home gym enables you to workout using a lot of calisthenics movements. This lets you create the resistance by using your bodyweight. You can then alter the difficulty of the exercises by how fast or slow you go, as well as the number of reps you perform. This home gym equipment enables you to workout with different exercises to most other home gyms. We were impressed by the bench that comes with this home gym equipment. It can be easily adjusted to ensure that it fits your needs perfectly. You can alter the incline level to use the cable pulleys in a wider range of ways. 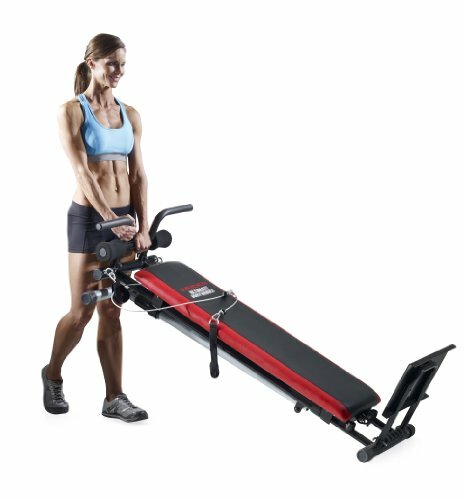 This allows you to workout with more exercise options and add versatility to your sessions. The more you increase the incline, the harder the workouts will be. They make the weight resistance feel harder! The pulley system available is awesome and easy to use. It allows you to workout with a larger range of motion to make it more difficult, which means better results. You can connect various attachments to the pulley system to perform a wide range of exercises. 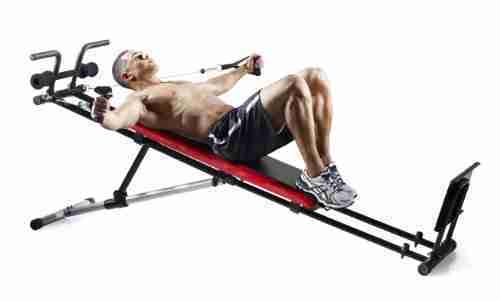 You can then adjust the incline level of the bench that’s supporting you to make it more difficult or easier. If the bodyweight exercises don’t feel challenging enough for you, you’re given the option to add more weight. This is because they enable you to add an extra 50 lbs of weight. As a result, you can make your workouts much more intense. People who are more experienced with working out love this benefit. We liked how they’ve used steel materials to construct the tubing. This gives you the assurance that it’s a sturdy piece of equipment that can handle intense workouts without wobbling. Furthermore, it will last you for a long time too. Putting this home gym equipment together is fairly easy. Most people are able to have it set-up and ready to use within just 20 minutes. All the instructions are provided to make it easier. The Marcy MWM-990 is our number one pick due to how it focuses on building muscle and strength. These are the main fitness goals that most people are looking to achieve while working out from home. However, it does have a maximum weight stack of 150 lbs and you can’t add any more weight to it. Therefore, it may not be best for experienced lifters. 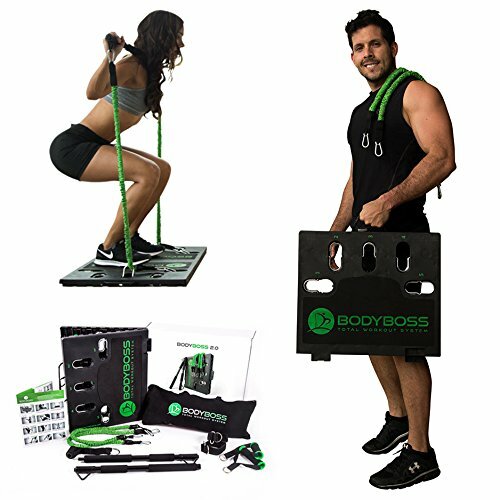 Those who are looking to workout from home but also need to be on the go would be more interested in the BodyBoss Home Gym 2.0. It has a wide range of exercises available and can be transported, hassle-free. Our last recommendation is the Ultimate Body Works. We liked how it incorporates your bodyweight into the exercises. The pulley system combined with the adjustable bench lets you customize your workout intensity to a tee. While you can make it more compact for easier storage in your home, it may not be as easy of a process as some would have hoped for. So, you now know more about what the best home gym equipment for under $500 has to offer. Be sure to consider the main benefits that you want to receive from a home gym before purchasing one. This will help you tremendously to narrow down your search and find the one that suits your needs best. Use our review to help make that process easier!